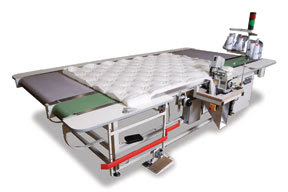 Porter International makes one of the most popular mattress panel flange machines in the world - the PFM-4000. The high throughput capabilities and durability makes it as productive as any flange machine in the bedding industry. Though the PFM-4000 is a great machine in itself, Porter International has combined the PFM-4000 flanger with other equipment to make it even more productive. The ATA Flangemaster®, shown in the following video clip below shot at a previous ISPA EXPO, combines the PFM-4000 sew head with an air table and a robotic turning arm. This semi-automatic system can enable any operator to flange panels with ease and it frees them to multi-task on other nearby operations during this process. Another recent modification to enhance flanging performance is the ErgoSmart 4000 belt table, equipped with a PFM-4000. 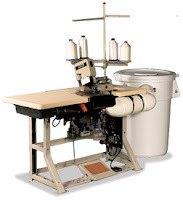 Motorized belts, syncronized with the sew head, can easily turn the quilt panel after each side is flanged and discharge into an awaiting cart or work station when completed. Effective flange machines are crucial to a mattress factory. Come to GSG booth 2625, at ISPA EXPO, to see the great values Porter International can offer for your next mattress flanger.